I just got this great chopper from Brieftons. This is a large 4 cup chopper. It is great for chopping items, it also has a mixer attachment as well. It’s all plastic, but durable. Simply pull on the green circle to pull the cord that causes the blades to spin. I use this when we go camping most. We don’t always go places with electricity when we are camping. It’s small enough I can pack it and it makes chopping/mixing pretty quick and easy. It’s a nice little tool to have when you don’t have electricity! ✓ DESIGNED FOR A PERFECT CHOPPING / BLENDING JOB: Features sharp stainless steel blades for fast and even chopping/mincing, comfort soft grip lid, anti-skid base, easy pull cord, and a large handle ideal for easy leverage. Also comes with an extra mixer blade for effectively mixing/blending ingredients. ✓ POWERFUL & VERSATILE: Powerful handheld herb, vegetable, food chopper / mixer / blender. Perfect for slicing and mixing vegetable/fruit salads, cutting various foods for baby, chopping nuts, herbs, veggies, pesto, hummus, salsa, guacamole, meat for meatloaf, ice, and more. It can be used equally well as a vegetable chopper, salad chopper, onion chopper, garlic chopper, herb chopper or as a general-purpose manual food chopper. ✓ LARGE & SAFE TO USE: 4 Cup Capacity. Great for all kitchens, RVs, travel and camping. Made from BPA free, food safe plastic. Blades are all concealed during use for the utmost safety | EASY CLEANING: Blades, bowl and storage lid are top-rack dishwasher safe. Components come apart for easy cleaning. ✓ HOW DOES IT HELP YOU? It’s convenient to use, and makes vegetable preperation fun and easy. 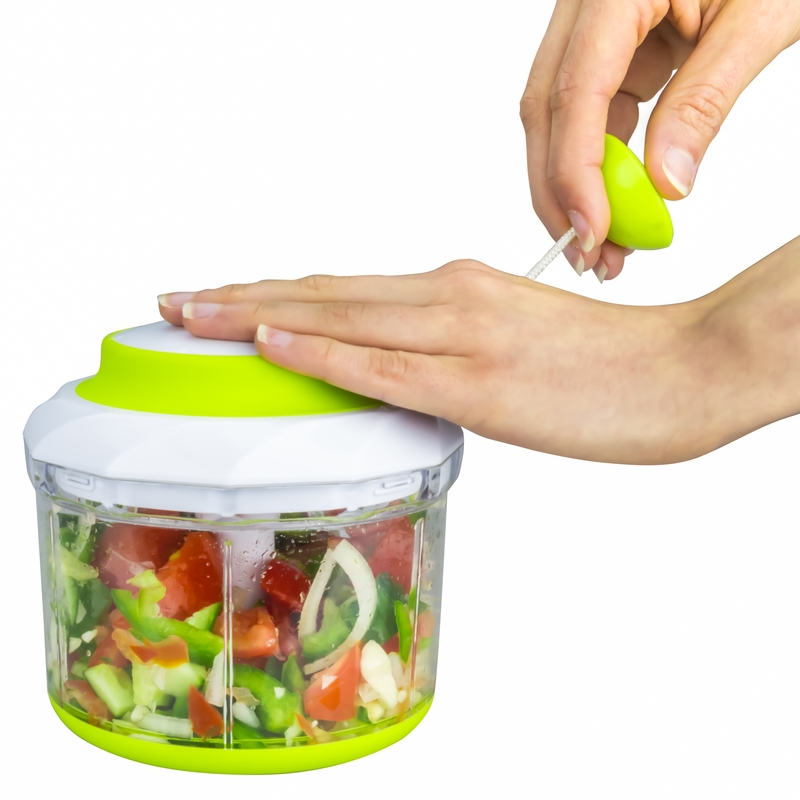 This hand food chopper takes the hard work out of chopping vegetables, fruits, nuts and herbs. It is the perfect onion chopper that doesn’t make your eyes water. In just a few pulls, the patented blade mechanism begins to chop and blend your ingredients, with no electricity required. The included mixer blade can blend ingredients quickly ✓ BUY WITH CONFIDENCE: We are the trusted kitchen brand with thousands of happy customers. You get a full unconditional money back guarantee if you are not happy with your Brieftons food chopper. ✓ SUPERIOR VALUE: Bundle includes the Brieftons Food Chopper (4-cup version), a printed manual, the exclusive Brieftons Spiral Slicer Recipe ebook, Brieftons Guide to Summer Salad Recipes ebook, and Brieftons Salsa Recipes ebook with great recipes you can make using your food chopper right away, plus outstanding Brieftons customer support, and more Brieftons ebooks on the way.